South Sudanese people hold signs as they await the arrival back in the country of South Sudan's President Salva Kiir, at the airport in Juba, South Sudan, June 22, 2018. Peace talks between South Sudanese President Salva Kiir and rebel leader Riek Machar ended without an agreement in Addis Ababa, but they may meet again, possibly as early as next week in Khartoum. South Sudan Information Minister Michael Makuei, who returned to Juba from Addis on Friday, told reporters that the IGAD Council of Ministers had declared the high-level forum to be over. He said leaders of the Intergovernmental Authority on Development had urged Kiir and Machar to continue negotiating on the areas of disagreement and meet in Sudan's capital next week, with future talks possibly to be held in Nairobi. "The IGAD summit decided that all the provisions that are agreed should be separated from the provisions which are not yet agreed, and that the imposition of any agreement on any party is not a solution to the problem of South Sudan," said Makuei. Representatives for both Kiir and Machar confirmed that no agreements were reached in their meeting Wednesday in Addis. The two men are at the center of a civil war that broke out in late 2013 and has displaced more than 4 million South Sudanese. While Makuei said Kiir and Machar committed themselves to working toward ending the conflict, the government is not ready to see Machar seated in the next transitional government. "The people of South Sudan have had enough experience of Riek Machar and as such we are not ready to receive Riek Machar in his position so that he can come and cause another J-2. 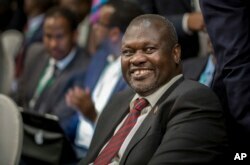 We are not ready for that," Makuei told VOA's South Sudan in Focus. Makuei was referring to the outbreak of violence in July 2016 between Machar's bodyguards and government forces outside the presidential palace, often called "J-2," which kicked off another wave of deadly fighting across the country. Mabior Garang, communications chair for the opposition SPLM-IO, said Makuei's statements were "unfortunate at a time when the negotiations are at a high level of maturity." Garang called Makuei "a known peace spoiler" in a statement released Friday and accused of him of being intent on "derailing the peace process." South Sudan's opposition leader Riek Machar attends peace talks at a hotel in Addis Ababa, Ethiopia, June 21, 2018. IGAD heads of state launched a new round of South Sudan talks 10 months ago with the aim of revitalizing the collapsed 2015 peace deal. Akuoch Ajang, chairman of the South Sudan Civil Society Alliance, said Kiir and Machar should prioritize ending the conflict. "We have not seen the will of committing themselves to the interest of the people. Instead they are negotiating for positions — who is going to be first vice president, member of parliament, who is going to be minister. For us as citizens, we want peace," Ajang told South Sudan in Focus. Some regional leaders also expressed frustration with IGAD. Ethiopian Prime Minister Abiy Ahmed Ali, who hosted the Kiir-Machar meeting this week, posted Friday on his twitter account, "The crisis in South Sudan has grown to become a crisis in each of our respective countries in the region. Our vital national security interests are at stake. We need to act and act now."